Get ready to start your new life in a village by the seashore or in the country. But you won’t be alone! You’ll get to adopt a Petz pup to help you make friends and help the village grow! Petz Beach & Petz Countryside is like a cross between two different games: Nintendogs + Cats and Animal Crossing: New Leaf. 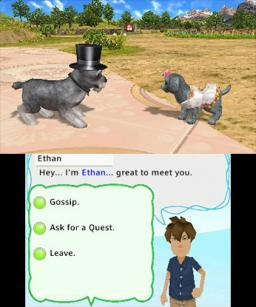 It’s a virtual pet simulator like Nintendogs, where you use the stylus to take care of your new friends. But it’s also like Animal Crossing in that you and your Petz help out neighbors, catch fish, bugs, and shells for museums, and buy decorations for your house and village. When you first start up, you’ll have to go through a tutorial showing you the ropes on how to take care of your Petz and interacting with your neighbors in the village. Make sure you have enough time to play this part, because they won’t let you save until the very end (I found this out the hard way), and the tutorial is pretty lengthy at around 20 to 25 minutes. Luckily, if you have both Petz Beach and Petz Countryside and have already started one game, the second game will read your extra data from the first title and allow you to skip the tutorial on the other game. You’ll care for your new Petz in your home. Shortly after you arrive, you’ll adopt a puppy from a selection of breeds. Later on you’ll be able to adopt more Petz breeds and even have a cat, too! 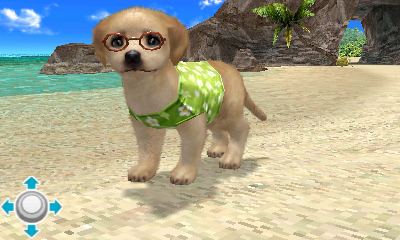 Caring for your Petz is similar to other virtual pet simulators on the DS and 3DS. Use the stylus and touch screen to feed, water, bathe, and play with your pet. You can also dress up your pets in clothes you buy at the shop. You’ll want to make sure your pet is happy so they’ll do better out in town when you need their help. To purchase pet care products and accessories, you’ll have to earn money. And the best way to do that is to help villagers in town. Once you step outside your house, you’ll lead your Petz on a leash and walk about town. You can talk to your neighbors and ask them for a quest. If they have one for you, you’ll probably have to deliver a package to someone or give them an item that they want. When you finish, you’ll earn money and Happy Points. Use money in the shops to buy pet care products, accessories, toys, furniture for your house, and later on, decorations for the village. When you earn enough Happy Points, your town will level up. When this happens, your town will upgrade and more people will move in, new products are available in the shops, and you’ll be able to teach your Petz more tricks and skills. Speaking of tricks and skills, this is how your Petz can help you out in the village. Just like in Animal Crossing, you can search for shells, fish, bugs, mushrooms, fossils, and more. You can give them to neighbors, sell them, or donate them to the Collection House Museum and Wildlife Reserves. Pay money at the training dojo to learn new skills. Then you’ll play small mini-games to sniff out shells, bark at fish and bugs to catch them, and dig for fossils. Also just like Animal Crossing, the game runs on the 3DS clock, so when it’s daytime or evening in real life, it’s the same time in the game, too. In fact, the only problem with this game is that the pet care section of the game is more of an afterthought, and the Animal Crossing style areas aren’t as good as what they could be. There is only so much you can do in a day, and then it can get a little boring at times. Plus, they don’t always do a good job of telling you upcoming events. I almost missed the Costume Party where you dress up your dog and look at Jack o’ Lanterns decorating the village. There is a calendar near the town hall, but they don’t tell you about it in the tutorial. Luckily the in-game instructions on the Home menu are better at filling you in on these things. So if you enjoy games like Nintendogs and Animal Crossing, you’ll probably like this game, too. Petz Countryside is nearly the same game as Petz Beach, but with different scenery. You’ll fish at a riverbank instead of a seashore, for instance. Also, each version has a few different dog breeds to choose from at first. You can put dogs in the hotel in one game and pick them up in another version, too. Not to mention send letters and photos via StreetPass. Nothing violent or objectionable in this game. Reading skill is a must for the text, though. The game could be considered somewhat educational; too, as there are dog breed facts on the loading screens and other tidbits about the animals you donate to the museum. Petz Beach and Petz Countryside are rated E for Everyone. How do I save my progress in countryside and Beach. I Countryside I tried to find a rock/stone with a green paw print on it around my house and I couldn’t find it. Could you help me out in this area. In Petz Countryside are cats useless or can they do something other than stay in your house. How many happy points do you have to get for your village to expand? How do you take a picture of your pet? I’ve only just got the game petzbeach (secondhand with no booklet) and my dog is thirsty, but when I return to the house I can’t find any water. Please can someone help. How do you delete your file anyway? because I messed really bad!!! What happens when you unlock everything in the game? How do you reset it? how many happy points till there are kittens !